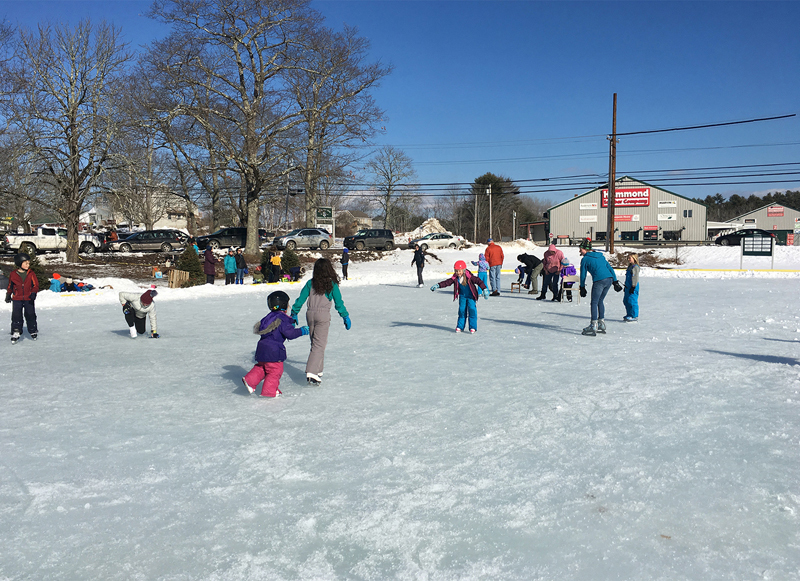 Skaters young and old enjoyed taking a turn on the ice at the Community Ice Rink at Damariscotta River Association’s Winter Fest. Though the weather was unseasonably warm and the ground bare two days earlier, a cold front and a few inches of snow arrived in time to provide just the right conditions for Winter Fest on Feb. 18. Damariscotta River Association, or DRA, partnered with Great Salt Bay School’s PTO to host the festival, celebrating the best of winter with outdoor fun. The ice rink was open for skating, a campfire burned nearby for toasting marshmallows, and DRA Education Director Sarah Gladu was on hand with her sled dogs to offer rides on the dogsled. Many kids and adults took advantage of the fresh snow for sledding on the big hill, as well as a good-natured snowball fight. A crackling fire provided some warmth and was just right for toasting marshmallows at the Damariscotta River Association’s Winter Fest. The DRA’s Winter Fest takes place every February as part of Great Maine Outdoor Weekend. A nonprofit, membership supported, and nationally accredited land trust and conservation organization, Damariscotta River Association is dedicated to preserving and promoting the natural, cultural, and historical heritage of the Damariscotta region, centered on the Damariscotta River. For more information call 563-1393, email dra@damariscottariver.org, or visit damariscottariver.org.